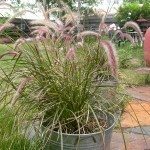 Red fountain grass is starting to turn white, like it's bleached in parts. I live in WA, where it's very hot. It does have some shade. oops, forgot this part. Penesetum love heat and sun. Actually, as much sun as possible to keep the rich burgandy color. If the plant gets too much shade, it will lose the color and have a decided greenish cast. 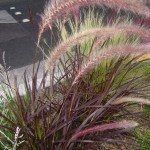 Pennisetum 'Rubrum' - Red Fountain Grass is deciduous with frost and "root hardy" to 20-25*. It is only evergreen in frost free areas. Waqshington spans 3 different USDA hardiness zones. Not knowing which zone you are in, it is my supposition that your plant is showing normal winter leaf dieback. If your teemps dip below 20-25*F on a regular basis or for extended periods of time, the plant will perish. Note, the above is for P. 'Rubrum' planted in the ground. Containered plants are generally 1 zone less hardy.